Find a gift among our great Personalised Photo Frames range. 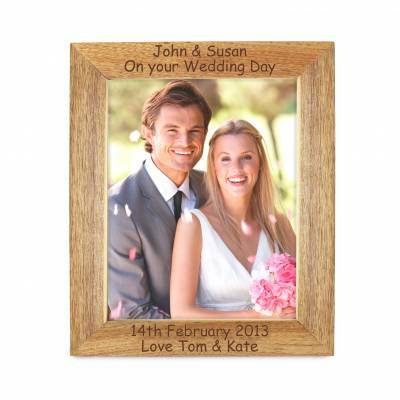 We have collected lots of superb value Personalised Photo Frames UK . Check out our offers on Personalised Photo Frames Next Day Delivery for that last minute gift. Photographs are still displayed around our homes and offices and help us all to remember friends and relatives through a snapshot in time that captures images that deserve to be proudly displayed in beautiful personalised photo frames. Whether it's a tiny frame or a large dimension photo frame the effect can sometimes be sentimental, inspiring, romantic or even humorous. To celebrate a really special occasion such as a birthday or wedding anniversary personalised photo frames are often proudly presented as loving gifts. Relatives often purchase personalised photo frames for children in the family circle. The special personal message engraved on the frame can usually be even more effective than the spoken word and because it is visible to read at all times it seems to reinforce how you feel about your loved ones. It really doesn't matter how many words are used but what words are used and how they are perceived by the lucky recipient. So, it is very important to get it right and therefore please spend a little time working out exactly what you want the personalised photo frame message to actually portray. If it is to be humorous then it is obviously not as important to get it right but then again, think about how many people are going to read the message over the years and is it suitable for children, grandparents etc? Also a humorous message may not look right on a very formal type of frame and also a sincere message from the heart will look out of place on a very informal or colourful personalised photo frame. If you are having a heartfelt message engraved on the frame please make sure you get the grammar right and watch for spelling mistakes. Also, if it is to be displayed in an office then bear in mind that strangers may see your personal message and this may embarrass the person you give the personalised photo frame to. This may prevent them from actually displaying it in public if the message is very intimate or a bit too soppy and sentimental. These days personalised photo frames come in many types of material such as wood, aluminium, stainless steel, silver, gold and plastic. Please try to choose the one most suitable for the person and the occasion. For instance personalised photo frames for christening can look really good in silver. Just compare the range on offer and select the most appropriate. Don't forget that for lots of personalised photo frames next day delivery is a really great option. We do hope that our website saves you precious time and money. Happy shopping!